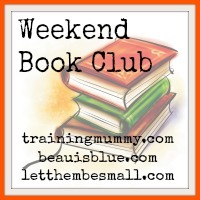 Welcome to yet another week of the #weekendbookclub which is hosted by myself as well as Suz over at Beauisblue and Sarah over at Letthembesmall. This is a great linky that is only works if people comment on other posts in the linky so can I remind people to comment on at least two, but as many other posts as possible. Thank you for hosting this great book themed linky again. I really enjoy reading around all the wonderful reviews.